The last few months have been exhausting. Thing 2 had her appendix removed. There were lots of school end activities. I have quite a few posts that need to be caught up on. This blog has been neglected. But this month is June and is June is my favorite month in Los Angeles. It’s the month when the trees turn purple. Yes, the Jacaranda’s are in full bloom the month of June. The blooming starts and May and they are pretty much done by the end of July. 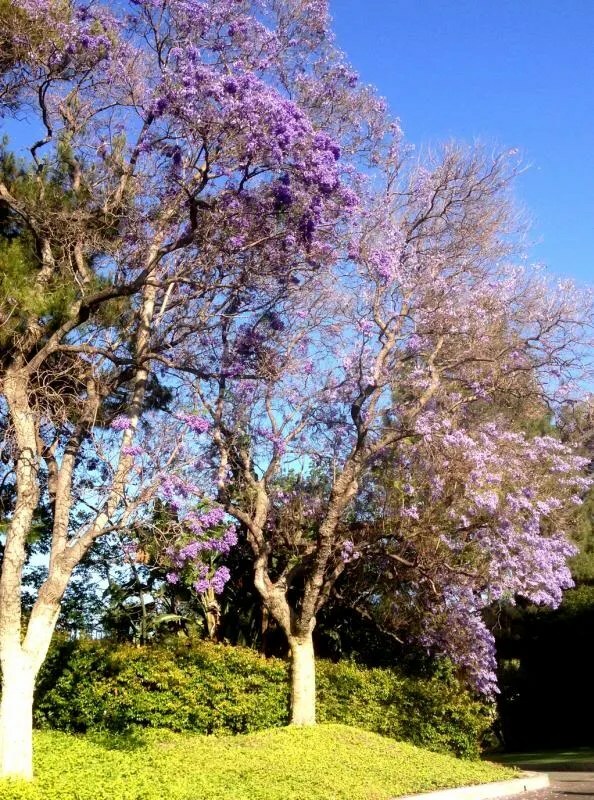 When the Jacaranda’s bloom, their entire foliage is purple. And these are big, big trees. They make a bigger statement than Liberace. Growing up in Alaska there were pretty much only two types of trees – birch and pine. I don’t remember any flowered trees. Maybe that’s why I love Jacarandas so much. But I can’t be the only one. In Los Angeles, there are entire streets lined with these Jacarandas. My kids are sick of me pointing out “purple tree” along our drives through the city. But the contrast of the brilliant purple against the azure skyline is magical! When I bought the Lake Balboa Bungalow – I spied that the owner had planted a Jacaranda right in the front. It was a very good sign! I’ve waited impatiently for it to bloom this year. It’s just started what will be a long, long life so it’s a very slight and slim tree right now. But by the beginning of June, I had my first purple foliage burst out. Enjoy the color of June. Soon the purple will be gone and the days are going to get hot.